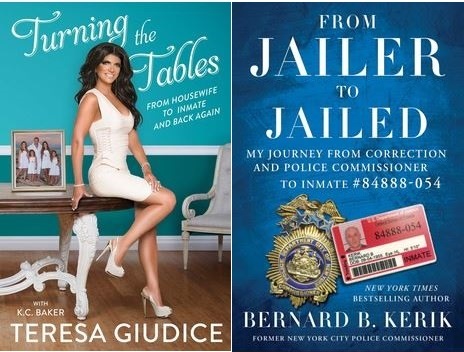 Today, felon Teresa Giudice's new tell-all prison memoir, "Turning the Tables" hits the bookstands. With a co-author from rag mag People magazine, K.C. Baker, Giudice's book promises to be best seller congratulating her on deceit, fraud and greed. Speaking of deceit, fraud and greed, corrupt disgraced former NYPD Commissioner Bernard Kerik was punished with profit from "his own" prison memoir, "From Jailer to Jailed" also published by Simon and Schuster. Remember when committing crimes brought the criminals public shame and forced them to repent and rehabilitate? Today's Obama Administration Justice Department lead by Loretta Lynch provides the white criminals a cottage industry of the "rehab", getting rich, skirting criminal restitution and providing a shared platform with law enforcement! Try that if you're black in America! Both WHITE criminal felons Teresa Giudice and Bernard Kerik live in the "mansions" their dirty crimes purchased and maintained. Both WHITE criminal felons Teresa Giudice and Bernard Kerik have friends in the media, book publishing and law enforcement world who are not ashamed to "help" them so long as there is money to be made. Both WHITE criminal felons Teresa Giudice and Bernard Kerik flaunt their white privilege by making their livings in the public rather than feeling the usual stigma felons feel every day trying to get a 9-5 job. Both WHITE criminal felon Teresa Giudice and Bernard Kerik live in the dubious state of New Jersey.... tawk amongst yourselves! Real House Wives of New Jersey idiots! Neither WHITE criminal felon Teresa Giudice nor WHITE criminal felon Bernard Kerik are the sharpest tools in the shed, actually EARNING their success. Both were "made" by their evil, idiot friends and greedy corporate and political cronies! Both WHITE criminal inmates,Teresa Giudice and Bernard Kerik, were apparently allowed to write books as part of their prison sentences served at US FEDERAL Prisons as part of their punishment! Life is good! There remain some distinct contrasts between the celebrated felons. WHITE criminal felon Teresa Giudice seems to have her family unit surrounding and supporting her. When was the last time you saw WHITE criminal felon Bernard Kerik's wife, Hala Kerik and/or family together? Sad. Very Sad. WHITE criminal felon Teresa Giudice has announced all her criminal fines and arrears on her house were paid allegedly by appearances for Bravo TV as reported by TMZ.com. Despite owning land in Florida, a book, a SALARIED non-profit "spokesman" role and numerous media appearances, felon on probation Bernard Kerik still owes his $180,000 criminal restitution (USA v. Bernard Kerik) and a new IRS lien of over $360,000.00!! Teresa Giudice's co-author, K.C. Baker is getting credit and compensation for her contributions to "Turning the Tables". We cannot say the same for felon on probation, Bernard Kerik, who allegedly manipulated then stiffed his co-author of "From Jailer to Jailed". Once a crook, always a crook, it appears!! 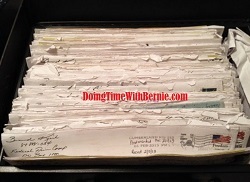 Try any of this crap if you're a poor unknown black felon on probation in Paterson, New Jersey! Black Lives Matter. Is even FEDERAL punishment equal in this country?